Home » Everyday » VIDEO: I Cannot Believe I Have Never Thought To Cut A Watermelon Like This.This Is So Smart! 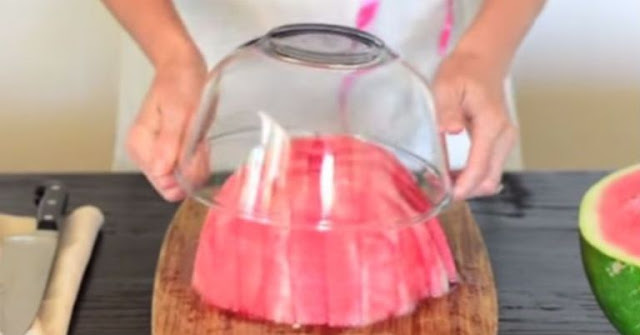 VIDEO: I Cannot Believe I Have Never Thought To Cut A Watermelon Like This.This Is So Smart! Watermelon is perfect for sunny days if you want to freshen up yourself.All of us are not even thinking when they are slicing the watermelon because it is very simple.But,by seeing a revolutionary watermelon cutting technique you will obviously feel different about it.Maybe you have already noticed that numerous fruits which were cut on the left side,are wasting too much of their nectar.The worst is that while you do this,you probably make mess around you.In the following video you can see how you should properly slice a watermelon without making a mess around you. First cut the watermelon in half. Make a small incision through the rind all the way around the center and the fruit will snap in half. Then flip the watermelon so the fruit is on its end and take the peel off. Do not worry about the extra white bits because you can go back and slice them off later. Cut off the top and clean off the white rind. Now you can cut in into small, simple slices. Turn your cutting board 90-degrees and cut again in the opposite direction. Take a larger bowl, one that fits the watermelon and place it over it. Flip the cutting board over and you have got yourself a bowl of perfectly cut watermelon slices. It does not get easier than that right? By watching this video you will get inspired how to cut a watermelon.